A good news, Ashampoo Music Studio 2018 just released. All users around the world can download Ashampoo Music Studio 2018 with free license key. To get the free serial key just download the installer on the giveaway page. Just requires 2-5 minutes to get it for free. Ashampoo Music Studio offer complete tools to convert, rip/burn audios, edit, and many more. You must download it if love music. Although the features not completes as Ashampoo Music Studio 7 but it has almost complete features to manage your music collections. Get a free copy of the Ashampoo software on the giveaway offer. Just complete the following steps to get Music Studio 2018 license key for free. Next steps, download the latest version installer here. After download, install on your computer and use your license key to activate full features. 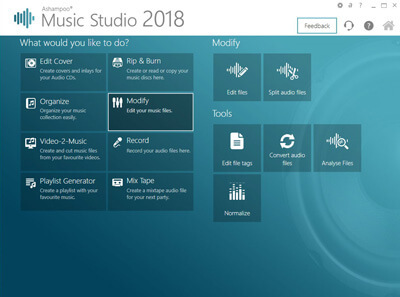 New version Ashampoo Music Studio 2018 only works on Windows 7, Win 8/8.1, and Windows 10. Highlights features on the software is burn, edit, rip, and audio converter.